Published: Aug 22, 2015 to ? Kuzumi-kun, Kuuki Yometemasu ka? has been published digitally in English as Kuzumi-kun, Can't You Read the Room by Yen Press since July 25, 2017. This manga is a bit similar to Tomo-chan wa onnanoko and Gekkan Shoujo Nozaki-kun. Honestly, I wasn't really expecting anything from this manga at first. 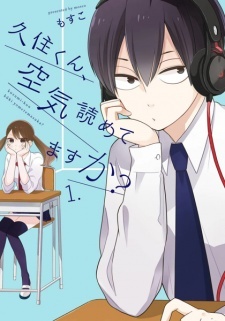 I thought it will be just one of those boring manga or annoying manga with female MC chasing after the guy, but reading this manga made me laugh so much, to the point that I do not even want to stop reading even though it was getting late(3am) but this manga kept me wanting more. Of course the plot is a bit similar to GSNK with the female lead who have a crush on the male lead who doesn't seem to be able to read the atmosphere and completely dense, but at least this one have a clear hint of romance. It is actually one of the things that I am looking forward to. I think I have seen some manga characters who looked a lot like Erika...actually I feel like I've seen most characters of this manga in other manga...but the artwork is not messy and it does a good job in making Kuzumi look weird sometimes and look so handsome sometimes. Erika: is the most popular girl in school, there are always guys wanting to hit on her. But out of all those guys, the one that caught her attention the most is her weird, short and lame classmate Kuzumi who doesn't seem to care about the world. He's always on her mind and her eyes is only set to him, but she doesn't want to accept that she likes him - how could she fall for someone like him? and so she's in constant denial about what she really feel for him. Kuzumi: The male lead of this series. He's super short and look so weird most of the time. At first, I thought 'he looked retarded' because of his face and the way he act but, the more I look at him,the more attractive he gets (although he looked so young for his age,especially compared to his classmates). He's always doing something weird and he always pops-up anywhere and he's super dense... but is he really dense? does he really not know anything? is everything really just coincidences, destiny?or... was it all planned? There's so much I want to know about him. My opinion regarding this manga might change in the future and so is, my review and my score. However, this is how I feel for this manga right now. I LOVE LOVE LOVE this manga, honestly its such a sweet rom-com. You really need to follow the story from the start and not stop in the middle to experience the whole story. Some people may feel that the development between the two main characters are a bit slow and frustrating, but trust me, just continue reading. I really enjoyed this manga a lot (more than I expected). I stumbled upon this when I was looking for a manga like Tomo-chan wa Onnanoko! and I'm really glad I discovered this one. If you read Tomo-chan wa Onnanoko! then you can say the story is kinda like that. Well, not really the same but more like the girl is in love with a dense guy. But this one, the girl is the "in denial" type. It was enjoyable cause it was funny to see the girl's struggles and being in denial that he's in love with the guy but keeps looking/chasing for him anyway (she's the most popular girl in school btw). The characters are likable too. The main guy, Kuzumi... I'm actually amazed that he barely said anything in the manga (I think he only spoke 3 times lol) but you will actually like him? And even though he is portrayed as short, boring and lame guy, he can actually look so cool at some point? And I'm really REALLY curious to know what he's really thinking (especially towards the girl). As for the girl, Erika, while she's really funny and cute, it's kinda frustrating sometimes when she's always denying that he likes him so yeah, sometimes I get irritated but not that much cause she's still funny. I was torn between 8 and 9 for my overall but for now, 8, cause I've only read up to chapter 19. While it left me super hanging and wanted to read more, I feel like things will get more exciting and I hope it won't disappoint me cause so far, I really like it!